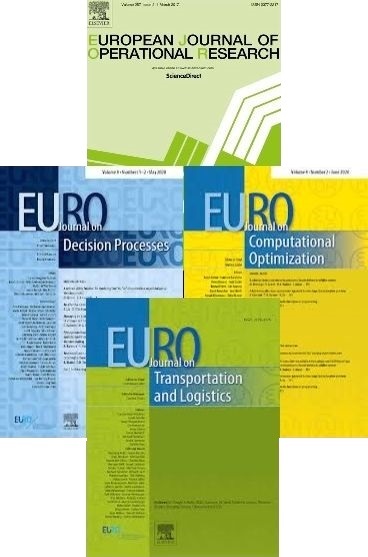 The EURO Journal on Decision Processes (EJDP) promotes and publishes scientific knowledge on the theoretical, methodological, behavioural and organizational topics that contribute to the understanding and appropriate use of operational research in supporting different phases of decision making processes. Methodologically, EDJP covers both qualitative and quantitative approaches to the scoping, modelling and solution of decision problems. The scope of EJDP is focused on the connections between operational research and decision processes. Thus, for instance, EJDP welcomes submissions which (i) present relevant advances in problem structuring, decision analysis and multi-criteria decision aiding, (ii) address questions of process design, model validity and communication in connection with techniques like data mining, forecasting, optimization, simulation, and performance measurement or (iii) provide reflective accounts of decision processes that exemplify uses of operational research in application domains such as energy, engineering, environment, finance, health care and operations management. EJDP primarily publishes original research articles, but surveys and tutorials can be considered as well.